Welcome to my vacuum tube audio page, which I dedicate to the reader who seeks an in-depth understanding of amplifier design-- who wants to learn the factors that contribute to audio quality— who doesn't buy the myths of the high-end marketplace, where old designs enhanced with "premium" components and dressed up in impressive packages command astronomical prices. You will encounter some deeply thought out and thoroughly analyzed new designs with exceptional sonics, including the preamplifier and power amplifier I'm now listening to. Though I do my best to keep it readable, portions of some articles are unavoidably technical. Important notice: I haven't been actively involved with audio since 1997. I wrote these pages to preserve my ideas and work from the 1990s. I am unable to answer questions about the latest developments in tube audio, the latest versions of Orcad/PSpice, etc. Since my 1998 move to Colorado, audio has taken a back seat to photography. I have a small problem that prevents me from becoming more involved: I'm contented. Satisfied. Happy with the sound of my system. A contented audiophile is an oxymoron; it's the ultimate bad attitude. If everyone were contented, there would be no invention and we'd be stuck in the stone age, listening to music amplified with transistors*. My discontent is now focused on photographic imagery and on measuring and understanding photographic image quality using the Imatest program. Photographs are works of art that function on many levels; amplifiers have a rather simple task to perform. The quest to make finer images is infinite; I've accomplished my goals in amplifier design— for now. *Actually, I have nothing against transistors. With proper design they can sound fine. I just couldn't resist the ironic twist. Of course there are horrible sounding designs that feature specs like "0.001% total harmonic distortion at rated power output." I explain the bad sound in Feedback and Fidelity. Nevertheless I'm driven to share my knowledge. I'm firmly convinced that tube amplifier design is mired in a dark age and most so-called "progress" is advertising hype. When more people learn to use SPICE computer modeling and correlate it with listening results, the art of tube amplifier design will rise to a new and brilliant level. A list of books and publications I have for sale can be found at the bottom of this page. Loose screws? Sometime in the late 1980's I visited an audiophile in San Diego. When he opened the door he exclaimed, "Norm! I've made the most incredible discovery! A simple modification that really improves the sound— opens it up, sharpens the imaging, and deepens the soundstage. I've loosened the screws on all my chassis. You gotta hear it!" He learned this tweak from a friend of his who had made a small fortune with a "CD enhancer" spray called Finyl. At the time, the ads for Finyl claimed it would increase the number of bits of resolution. His system sounded terrible. I'd heard rumors that some audiophiles had their screws loose, but I never took them literally until that evening. Gordie Freedman evidently had similar experiences. Maybe the problem was his cable lifters, which were made of plastic and only lifted his cables 4 inches. Here's what Mapleshade says: "Odd as it may seem, laying audio cables on an artificial fiber carpet will immediately dull the sound of your stereo. And that’s true for all cables, not just our Clearview wires. Unfortunately, the carpet is a huge mass of low quality insulation (dielectric). It absorbs and smears energy from the field around the wire. The effect is pretty grim, making music sound both dulled and harsh. A simple ear-tested solution is to raise the cables off the carpet by at least 8 inches. That’s exactly what our maple Triad does." You're apparently out of luck if your decor is oak or walnut. I gotta quit. You won't find any more of this stuff on my site. I promise. Improved Vacuum Tube Models for SPICE Simulations An update of the article originally published Glass Audio, Vol. 8, No. 5, 1996, p. 18. Tubemods.zip Shift-click to download the tube models as a compressed file which must be "unzipped" with Pkunzip, Winzip or a similar program. 87 kB. PSpice shareware package instructions Instructions for the models and circuits in Tubemods.zip. Finding SPICE tube model parameters A Matlab program for automatically determining tube model parameters from data sheets. Feedback and Fidelity Submitted to Stereophile in 1998 and landed in a black hole on the editor's desk, probably because it was too technical. Deals with the effects of negative feedback (NFB) on sound quality. Although NFB has bad rap among audiophiles, it has great benefits when done properly (it's often done badly), but it has some limitations in power amplifiers. It also explains why total harmonic distortion (THD) is a misleading indicator of audio quality, i.e., THD is an unsuitable measurement. Part 2 contains basic plans for the Local Hero amplifier, a modification of the Dynaco Mark 3. SPICE and the art of preamplifier design An update of an article originally published Glass Audio, Vol. 9, No. 2, p. 1 and No. 4, p. 38, 1997. Discusses preamplifier design using the Dynaco PAS as an example. Contains designs with outstanding sound quality, some suitable for PAS modification projects, some for new projects. The Emperor's New AmplifierTM My ultimate dream amplifier. 80 watts of class AB2 triode power with low feedback (none global) using a wide bandwidth toroidal output transformer with a servo to maintain dc-balance. Designed with extensive PSpice simulation. Arguably the most sophisticated vacuum tube amplifier design ever. AmericanRadioHistory.com (a fantastic resource; a real treasure trove for geeks, discovered 2019) Contains complete scans of magazine issues on radio, broadcasting, and electronics technology. Of particular interest is a complete archive of Audio Engineering/Audio magazine from 1947 through 2000. I found several RCA Tube Manuals here. Worth digging into. 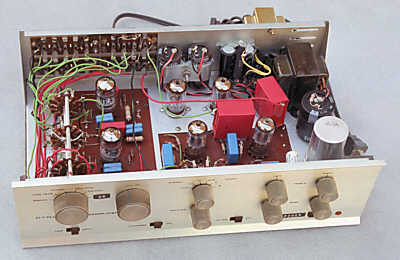 Duncan's Amp Pages The best source of vacuum tube data sheets and links. A Brit who never uses the word "valve." American cultural imperialism strikes again. Frank's Electron tube Pages Another amazing tube data resource. Art Ludwig's Sound Page Lots of great stuff on the physics of sound, human hearing, and audio design. From a passionate physicist, passionate about the art of music. The Art of Electronics by Paul Horowitz and Winfield Hill. Their book is a must for anyone who wants to really know electronics. Beautifully written. WinSpice A free Spice3F4 Port for Windows 95, 98, 2000 & NT. Very intriguing. Will simulate much larger circuits than evaluation PSpice. PSspice student version (version 9.1 at last look) has limited capabilities by standards of solid-state circuit design, but it can be amazingly useful in simulating vacuum tube amplifiers, which tend to have fewer components. Hard to find on the OrCAD website. I had to go to the CadencePCB home page and click on All Downloads. The full versions are expensive. LTSPICE/SwitcherCADIII A free and unlimited SPICE simulation program from Linear Technology with support through its user group, (http://groups.yahoo.com/group/LTspice). LTSPICE is highly compatible to PSPICE on a netlist level for analog components and models. Of course, the schematic editor and symbol editor are different. Recommended by Helmut Sennewald, who is one of the two moderators of the LTSPICE Yahoo-group. Sounds excellent; I haven't tried it. BeigeBag Spice B2 is a promising low-cost ($189) alternative to PSpice. The evaluation "lite" version is more severely limited than the PSpice student version. I haven't tried it out. One Electron offers design services and manufactures audio transformers. But what really makes their page interesting is links to service manuals and schematics for electronic equipment , and especially for audio equipment (classic amplifiers, tuners, etc.). Also has some entertaining and edifying links. A reader informed me that Alex Cavalli had some excellent PSpice tube models. 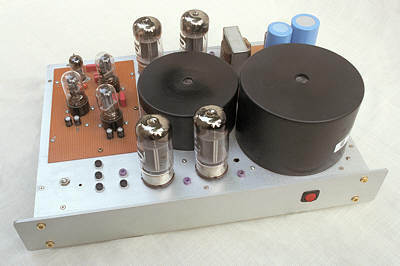 His article, A Fender-Tone Tube Headphone Amplifier, on Headwize.com, looks like a good place to start. Interesting site! James E. Lanier's PSPICE Triode Calculator is a promising program for finding tube model parameters. It's still under development; he plans to expand it to include tetrodes and pentodes. Jeroen's Technical Center: Motega (Modeling Of Tubes Employing Genetic Algorithms). Written in Matlab. Plitron Manufacturer of superb toroidal output transformers. Includes a treasure trove of technical publications. Ariel Loudspeaker, designed by Lynn Olson. After hearing Chris Brady's Ariel I purchased a kit from North Creek Music Systems. I haven't had time to build it. Accel Thermal makes heat sinks. Valutronics Swedish maker of kit loudspeaker and stereo power amplifier. Welborne Labs has some excellent technical information and schematics. Parts express has interesting stuff including Hammond transformers for tube amplifiers. ExpressPCB offers free software for PCB design and low cost board manufacturing in small quantities. I would give them careful consideration if I were currently involved with audio. Vacuum Tube Valley Strong on projects and history. Audioxpress Incorporating Glass Audio. Tube CAD Journal Excellent online magazine for DIY tube enthusiasts. The tube collector, published by a group of passionate amateur collector-historians. Chris's tube haven Fascinating projects and images of audiophiles in the Denver metro area (my neighborhood) | One Electron— John Atwood has nice technical articles and amplifier designs. Boston Audio Society has excellent events, articles, and links. Radiomuseum.org is developing a resource for antique ratios— descriptions, schematics, etc. Record collecting: I have about 7,000 LP's, two-thirds classical, and I'm trying to reduce my collection by eliminating duplicates and music I'm not in love with. I'm starting to compile links about collecting, labels and pressings for my own education. Labels in the UK are mostly different from the USA. UK pressings are regarded as having higher quality, but they're rare here. Some sites I've found: Harry Pearson's famous super LP list | Princeton Record Exchange has buying lists. I need more room on my crowded bookshelves, and I'm no longer actively involved with audio, so it's time to find a home for some gems— books and publications of real value to audio enthusiasts. Books Make an offer. I'm not sure what they're worth. I'll check eBay, but most of these are likely to be rare. F. Langford-Smith, Radiotron Designer's Handbook, Fourth Edition, 1953. 1498 pages. This is the big one; probably the gem of the collection. Red cover, but the back part of the binding is missing. Otherwise fine. F. Langford-Smith, Radiotron Designer's Handbook, Third Edition, 1941. 352 pages. Two copies. Alfred A. Ghirardi, Radio Physics Course, An Elementary Text Which Expllains the Principles of Electricity and Radio, Second Edition, 1942. 972 pages. Lots of wonderful old illustrations of 1930s technology. International Telephone and Telegraph Corporation, Reference Data for Radio Engineers, Fourth Edition, 1956, 1121 pages + Index. An excellent reference, from the good ol' days before ITT got involved with coups in Chile. George E. Valley, Jr., and Henry Wallman, Vacuum Tube Amplifiers, 1948, 743 pages. Serious material from MIT (not to be confused with the cable manufacturer with the same initials). Lawrence Baker Arguimbau, Vacuum-Tube Circuits, 1948, 668 pages. More from MIT. Samuel Seely, Electron-Tube Circuits, 1958, 695 pages. Just before the solid-state deluge. John D. Ryder, Engineering Electronics with Industrial Applications and Control, 1957, 666 pages. The phrase "industrial strength" gets tossed around rather loosely these days. This is the real thing. Morris Slurzberg and Willima Osterheld, Essentials of Radio-Electronics, 1961, 716 pages. Contains a chapter on Audio units ahd high-fidelity reproduction. About 80% tubes. Vincent Del Toro, Principles of Electrical Engineering, 1965, 775 pages. A general engineering text. Split 50-50 between solid-state and tubes, but not a great many circuits. Audio Engineering/Audo Magazine, about 95% of the issues from the beginning in 1947 through the 1980s. Unfortunately not complete— a few odd issues are missing. A real treasure trove of articles and designs. Issues prior to the early 1960s are the most interesting. I haven't catalogued them (it would take quite a bit of time), but I would if I had a serious prospective buyer. There are several boxes! Images and text copyright (C) 2000-2012 by Norman Koren. Norman Koren lives in Boulder, Colorado. Since 2003 most of his time has been devoted to the development of Imatest. He has been involved with photography since 1964. The material on this page was developed in the 1990's.